Melanoma in situ is a very commonly used phrase when discussing melanoma. “In situ” translates to “in place.” Basically, the phrase is used to describe melanoma skin cancer that has not left the epidermis. There are 3 different types of skin cancer. The deadliest but rarest of them is known as melanoma. This type develops in melanocytes, the cells that make melanin, the substance that gives color to the skin. Melanocytes are located in the bottom-most layer of the upper skin layer. Without treatment, cancer cells have a tendency of spreading to the lymphatic system and later to other body parts. 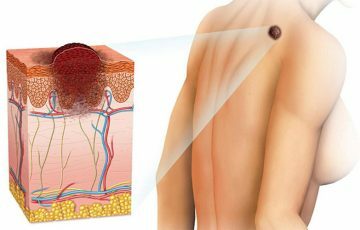 Melanoma tumors begin in the skin then penetrate into the dermis and later reach lymphatic and blood vessels. It is through the vessels that malignant cells travel to other body parts. 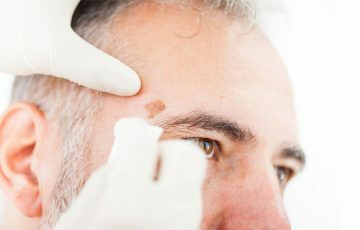 Melanomas that have spread are most dangerous, not only in terms of treatment but also in terms of tracing them with imaging tests. 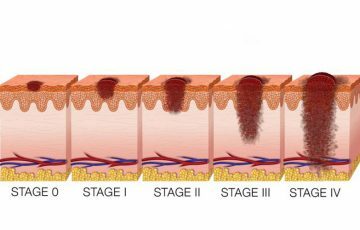 What causes melanoma in situ? 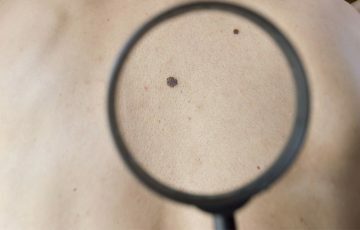 Almost any melanoma definition will include facts such as that the disease originates in melanocytes and has something to do with sun exposure. Melanoma is thought to be more common in middle-aged people, especially women. 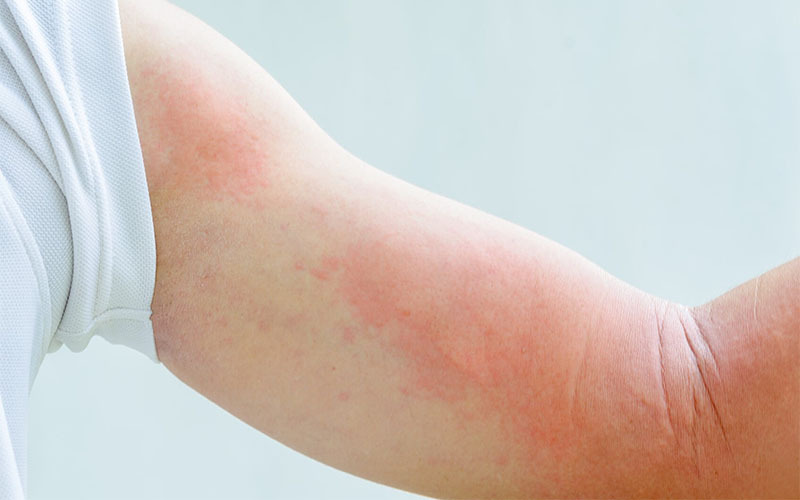 The disease mostly shows up in areas such as the neck, face, legs, arms and scalp. It can also occur in mucosal membranes and in the eyes. Apart from melanoma that develops on the hands and feet, other types appear to be encouraged by prolonged exposure to UV radiation. 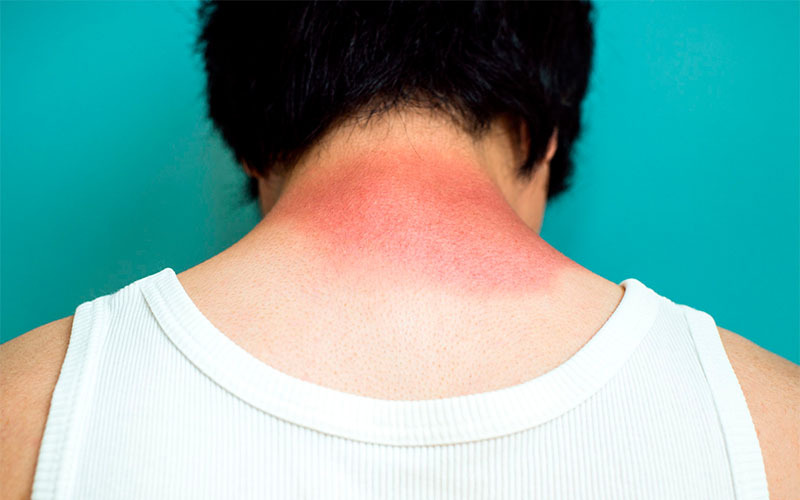 People who have histories of sunburns especially in their childhood years are at a higher risk. 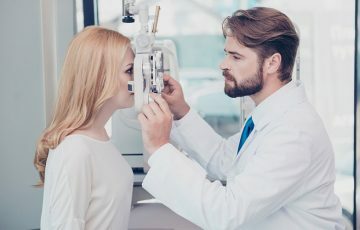 Other risk factors include having many moles, family history of the disease, being fair skinned, having blue or green eyes, and a weakened immune system. Since melanoma in situ is confined to the epidermis, most signs that may occur will be noticeable on the skin. The ABCDEs can be used to identify suspicious early signs. Asymmetry – melanomas are usually asymmetrical. This means that a line to divide the tumor or spot into identical halves cannot be drawn. Borders – borders are also referred to as edges. These are points at which discoloration ends. In normal moles, the borders are regular and well defined. The opposite is true for melanomas. Colors – when melanocytes clump together, they form benign tumors known as moles. Many melanocytes in one place result in dark or brown coloration. 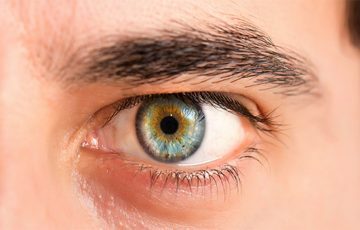 While this coloration is also likely to be present in melanomas, other colors such as blue, pink or orange may also be present. Sometimes, some areas of the mole will be more heavily pigmented than others. 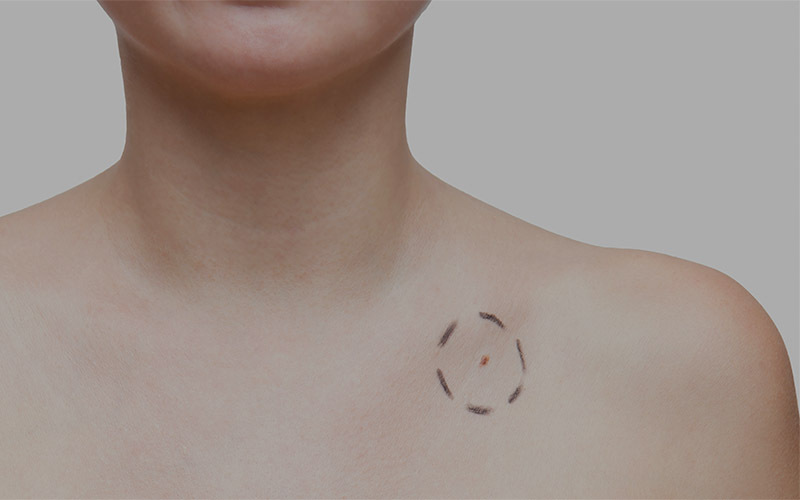 Diameter – melanoma in situ may be even less than 1mm in diameter. However, its thickness will keep increasing indefinitely. Some melanoma in situ tumors are as large as a pencil eraser. Evolution – evolution describes frequent changes that keep occurring in melanomas. The changes can be in terms of color, texture, size and shape. 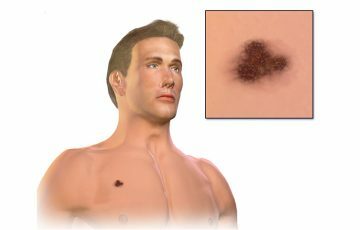 See what does melanoma skin cancer look like for more details. 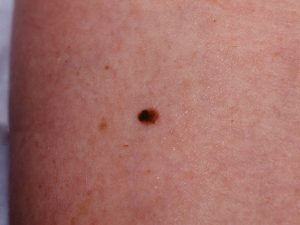 As it happens, there are some types of melanoma where affected cells don’t make melanin. 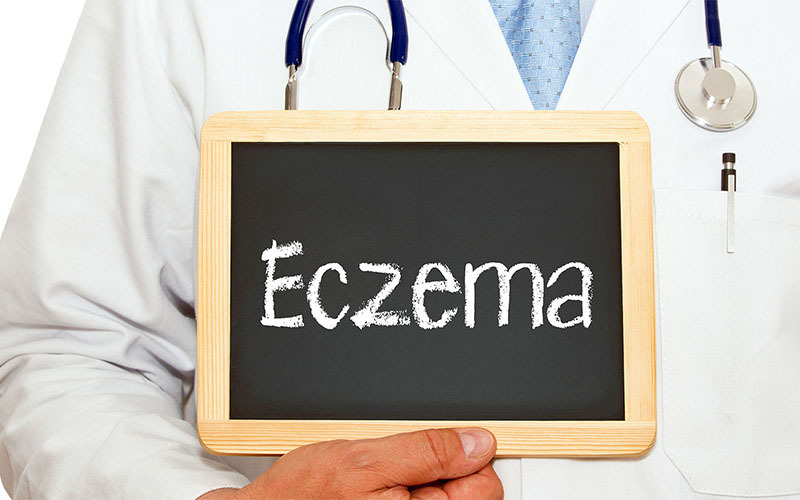 This results in pink, red or skin-colored tumors which can easily be taken for normal skin growths. Melanoma in situ margins rarely depend on the patient’s gender, location of the tumor or its thickness. Basically, margins refer to the thickness of tissue that will require surgical excision. This includes the tumor itself. Surrounding tissues are usually removed sometime after tumor removal to avoid recurrence. 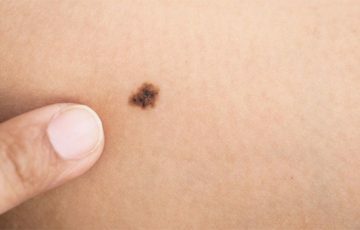 Melanoma in situ margins often range from 5mm to 15mm. 6mm margins have a success rate of about 85% while 9mm margins have a success rate of more than 95%. 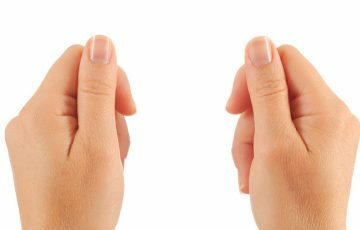 Large margins of up to 15mm have a success rate of near or equal to 100%. Lentigo maligna melanoma usually requires wider excision margins than other types. This is because the type tends to spread across the skin before becoming invasive. 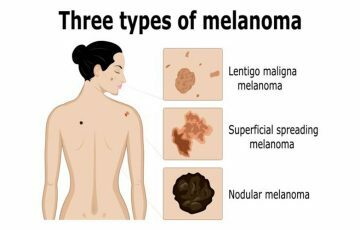 People who suffer from severe sunburns or with skins prone to sun poisoning are particularly at risk of developing melanoma of lentigo maligna type. Most cases occur after the 50th birthday. 9mm excision margins are now preferred to 5mm margins. This is mostly to reduce the rate of recurrence. Your doctor will, however, make the final decision depending on diagnostic reports. Melanoma treatment guidelines are usually developed by a team of professionals depending on a couple of factors. Melanoma in situ treatment is usually done with surgery. Pictures and images from imaging tests will assist the doctor to make an excision margin around the tumor. After that, the tumor will be cut out. Healthy skin surrounding the excision margin and the subcutaneous tissue underneath the tumor will also be removed. This ensures that no melanoma cells have been left behind. Normally, doctors follow-up the surgery with a wide excision. This involves removal of 5mm surrounding tissue in all directions. 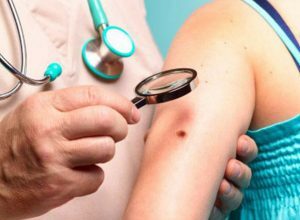 The procedure is aimed at ensuring that recurrent melanomas are avoided. Large tumors may require larger wide excisions. There are times that wide excision may depend on the location of the tumor. This is for example when dealing with uveal melanoma symptoms. Uveal melanoma begins in the uvea tract. This is the back part of eye which contains most of the blood vessels that nourish the eye. Melanoma in situ recurrence is most likely in the first 2 years after the disease has been diagnosed. About 3% to 6% of in situ melanomas often recur after excision surgery. Recurring melanomas respond effectively to extensive surgery. Melanoma can be in situ, locally invasive or distantly invasive. In situ tumors only affect the upper part of the skin. They have not even reached the subcutaneous layer of the skin. Local invasive tumors migrate to nearby lymph nodes that contain melanocytes. This occurs when several malignant cells break free from the original tumor, enter lymphatic vessels and get emptied into local lymph nodes. Distant invasive melanomas migrate to organs such as the lungs, liver, brain, abdominal organs and bones. The spread is facilitated by blood vessels. Distant invasive tumors have the highest recurrence rate, followed by in situ tumors. The margin between recurrence rates is not wide however. Recurrence occurs at the same site that a primary tumor was removed. Signs will still involve skin discoloration or presence of an abnormal mole. Patients are advised to report recurring cases as soon as possible. This is partly following the fact that statistics show cases of melanomas being on the rise, especially in younger people. Learning more on how to identify early metastatic melanoma symptoms may help. Once malignancy has spread from a local tumor, it becomes much harder to trace and treat. Melanoma in situ prognosis is considered the best. This is mostly because melanoma prognosis largely depends on the stage the disease is in. In situ tumors are in stage 0. In fact, some staging systems often combine stage 0 with stage 1. This is common in acral lentiginous melanoma prognosis. For clinical purposes, prognosis is given in terms of survival rate. 5 year and 10 year survival rates are commonly used for melanoma prognosis. 5 year survival rate, for example, indicates the probability that a patient will survive for the next 5 years after diagnosis. For in situ melanoma, survival rates are higher than 95%. The remaining 5% allows for the possibility of recurrence and missed spreading. Most doctors find it necessary to carry out tests such as sentinel lymph node biopsy. This test checks for signs of malignant cells in local lymph nodes. It is very important especially if the local tumor is ulcerated or when treating pink melanoma. It has been observed that cases of melanoma in situ in 20-30 year old age group are on the rise. Most have something to do with over-exposure to sunlight and use of devices such as tanning beds which emit UV radiation. Prevention against this disease can be done by avoiding direct sunlight and other sources of UV radiation. Measures such as applying sunscreen (SPF 15 or higher), wearing hats and seeking shade might help. Another very effective prevention measure is going for routine skin checkups. In fact, melanomas of the scalp and back are often caught accidentally. 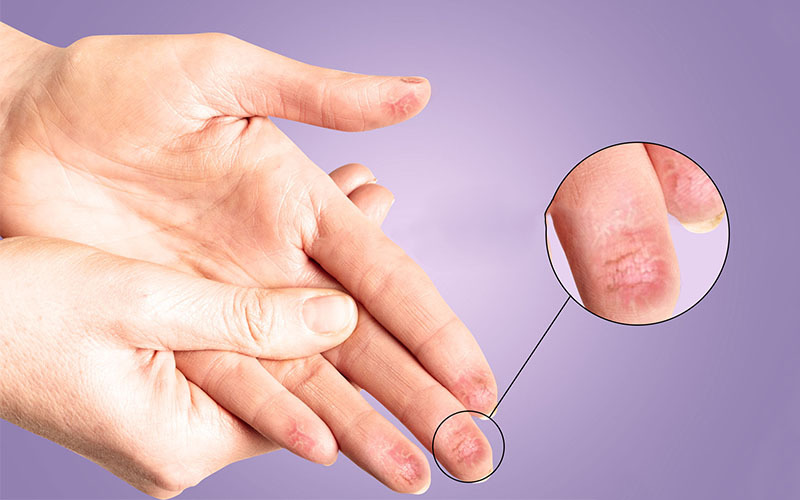 Check with your doctor in the advent of an abnormal mole, spot and patch on skin or streak under nails. It is important to remember that melanoma also begins in parts of the skin rarely exposed to sunlight. Vaginal melanoma is a good example. If you are to notice early warning signs even in such areas, check with your doctor immediately. 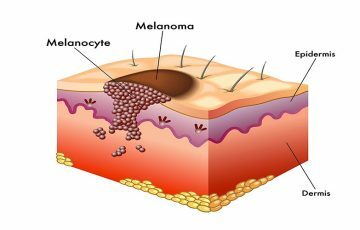 Melanoma in situ is confined to melanocytes located in the upper layer of the skin. As a result, it can be easily removed with wide excision. While some types of melanoma first spread across the skin before becoming invasive, other types such as nodular melanoma spread very quickly. This means that it may be only a matter of weeks or months before an in situ melanoma enters its most dangerous stages.